Learn what the Geo Fence Plugin is, how to use it, and how it differs from Push Notifications. What is the GeoFence Feature? 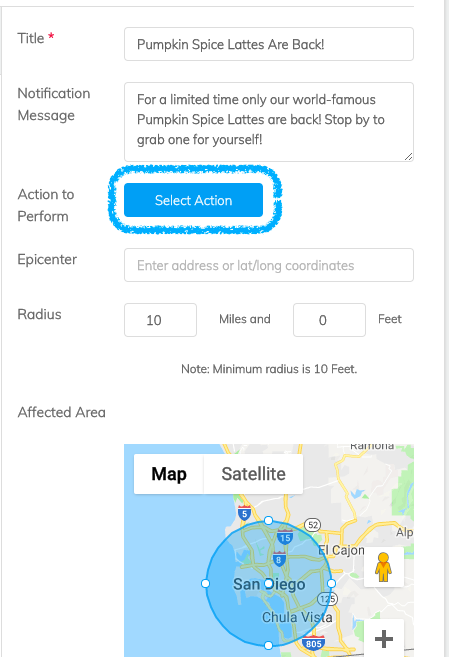 The GeoFence Feature provides the ability to set up location based notifications for your app! In this article we’ll go over how to set up the GeoFence Feature and give you some tips on how to best utilize it! What are some use cases of GeoFence Feature? If you’re building an app for your Restaurant you can use the GeoFence Feature to send out a notification listing your current specials. If you’re building an app for your Church you can use the GeoFence Feature to welcome people to church on Sundays or any other days that you hold events. If you’re building an app for a Boutique you can use the GeoFence Feature to send out a notification letting people know of your latest items for sale. If you have an app for a Music Festival, you can send out a welcome notification to all of your users who are entering the festival grounds. What is the GeoFence Feature’s primary function and what are the steps to accomplish it? 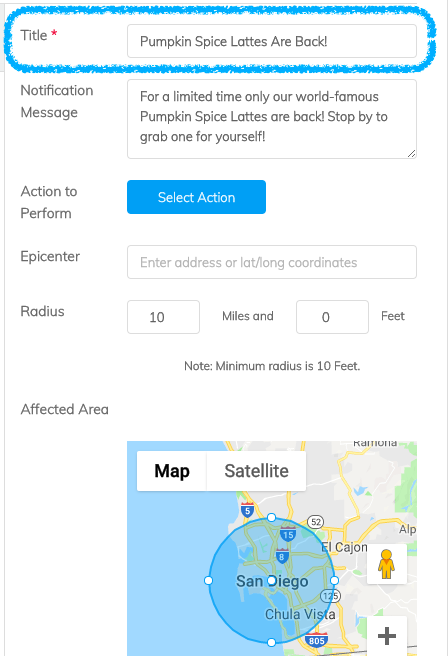 The GeoFence Feature provides the ability to set up location based notifications for your app. In order for GeoFence notifications to work, the app needs to be either currently open on a user’s phone or running in the background. 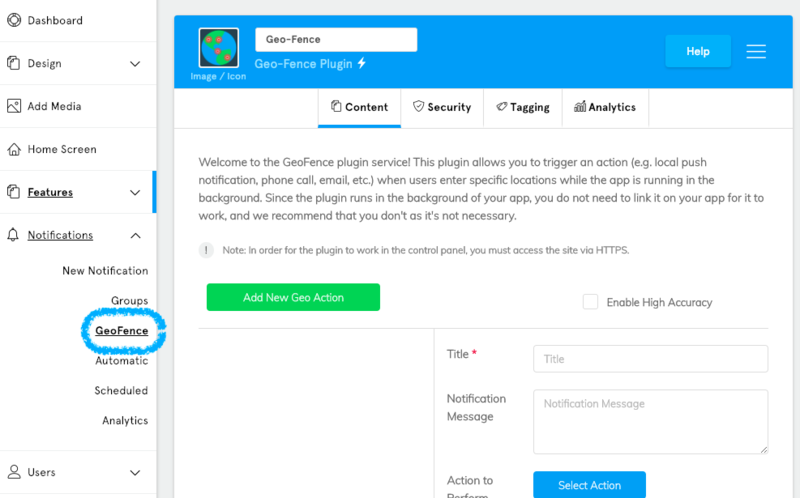 In order to set up GeoFence notifications within your app, you will need to go to the Feature Marketplace and create an instance of the GeoFence Feature. Note: Because the Feature runs in the background of your app, you don’t need to add it to the app (such as the side menu). Once you have created an instance of it from the Feature Marketplace you can continue with creating notifications for your app. The Title is what your users will first see in the notification. The Epicenter is the middle of where you want your notification to trigger. Enter in the address or latitude and longitude coordinates of where you want your notification to trigger. You can adjust the radius of the epicenter by adjusting the miles and feet. You can have a radius that is between a minimum of 10 feet and a maximum of 1000 miles, though we don’t recommend you make it that large. Note: We recommend that “Enable High Accuracy” is checked so that you have the most accurate measurements for your notification possible. You can give your notification an additional message in the “Message” section, though this is optional and isn’t required for the notification to be created. Once you have finished creating your notification, click the green “Add New Geo Action” button to save your notification. Note: If you are adding the GeoFence Feature to your app before it has been submitted to the app stores, you will need to add an example notification to the app so that when our publishing team submits the app, Apple and Google can use it for testing purposes. If you are adding the GeoFence Feature to your app after it has been published, you will need to reach out to us at support@buldfire.com to have your app resubmitted with the additional app permissions added that are required for the Feature to work. 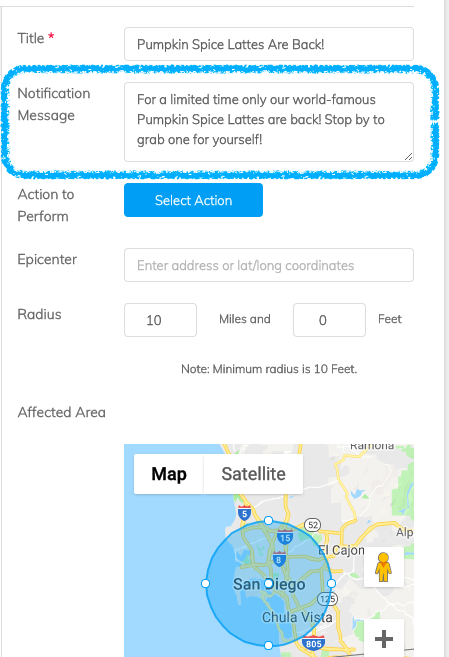 The GeoFence notifications have a cool-down of 24 hours, so if your users have already received the notification and they leave its radius, if they come back into that radius they won’t receive the notification for another 24 hours. This helps prevent your users from being spammed with the same notification multiple times. If you would like to learn more about Action Items you can do so here.